Since there is only about a month left until I move, I have been learning my moms recipes. This one was quick and really easy, not to mention so delicious and has my mom making this dish on request specifically when my aunt comes to visit us from Washington. A lot of my home recipes are Russian/Moldovan/Romanian inspired because my parents are immigrants from Moldova. Defrost 2 packets of beef or filet. On a cutting board, dice 4 onions into small squares, Put the onions into a large cooking pot on high heat. 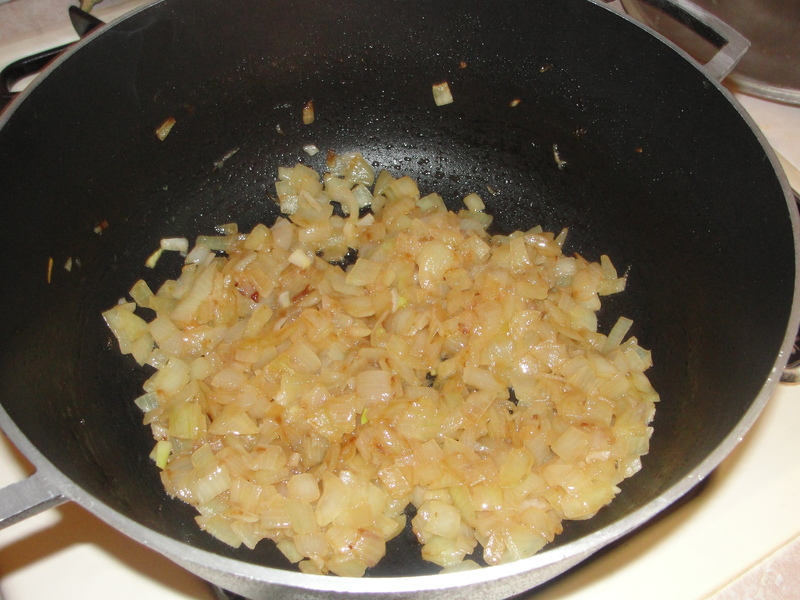 Put a little olive oil into the onions so that they start to look like this, browning consistently. When they begin to brown, keep adding water to make them softer and browner, keep adding water and stirring so the onions don’t stick to the walls, stir onions swiftly to release heat, so they brown evenly. Meanwhile, open the meat in the sink and rinse the pieces. If there are big pieces cut them in half. Leave the fat on the meat for juiciness. 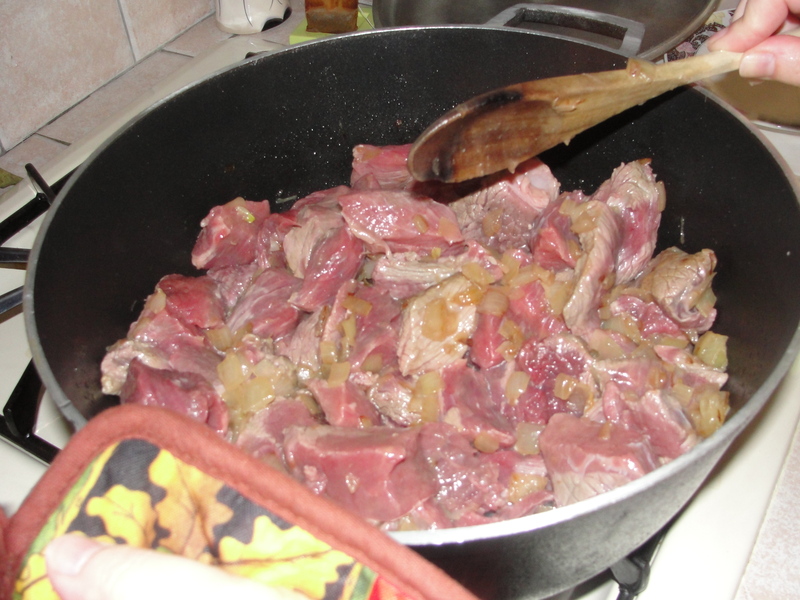 The meat should be cut in small squares. Add the meat to the pot when the onions get nice and brown. Stir the meat with the onions. Sprinkle pepper and garlic seasoning on top of the meat mixture. Just a coding on top. Most of the spices go in at the end. Stir the meat mixture every so often. When the meat is not pink anymore (after continuing stirring) and you see the juices starting to boil around, lower the heat a little bit. The pot should still be boiling. When the water from the juices comes all the way up just about halfway through the meat and there is no blood in the meat, finally, you have to add 2 cups of water (based off of two packages of meat) just so that the meat is covered by our mixture completely and boiling again. Add more garlic and pepper, cover the pot, lower the heat to a very low setting, and let this cook for 2 hours. 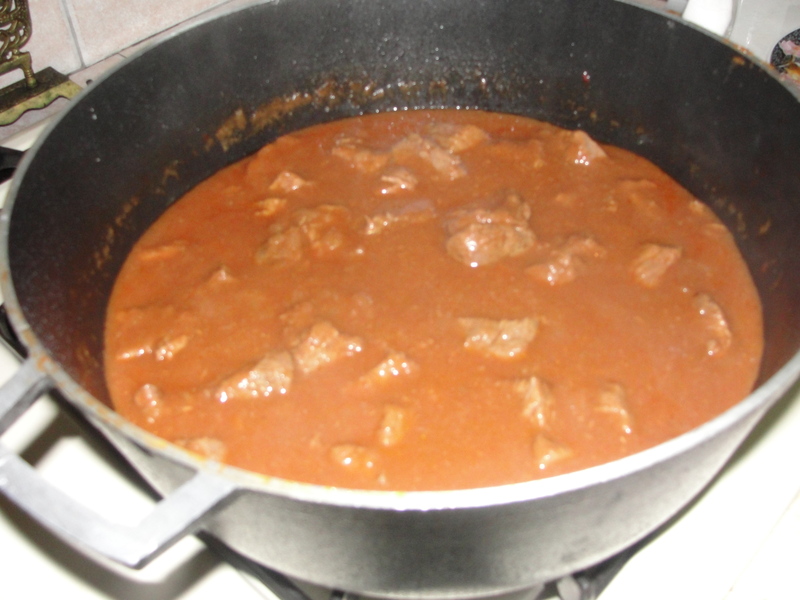 After 2 hours, use a fork and either taste or touch to see if the meat is nice and soft. It should taste juicy and delicious. Add 1 full jar of hunts tomato paste. Stir. Add salt to taste. Add about 2 teaspoons of sugar to taste. Stir again. Finally, Let it cook for another 10 minutes. Serve over any kind of pasta or with mashed potatoes! This dish is incredible on day 2 (best leftovers ever) because the flavor really sits in. ENJOY!